I'm hoping that a plush of this guy will exist one day, since there's already been a sketch of him. I'm glad to add him to my personal collection, and he definitely won't be leaving anytime soon! She does an amazing job with all her knitted plush, and has a lot of experience making them! His tail is poseable, and he is just so unique! 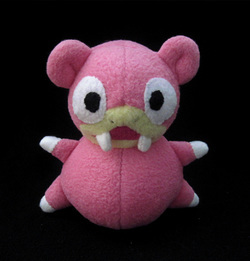 Adorable Slowpoke plush by Ambertdd in pokedoll style! There just isn't a plush that's as fuzzy, soft, and round as him! 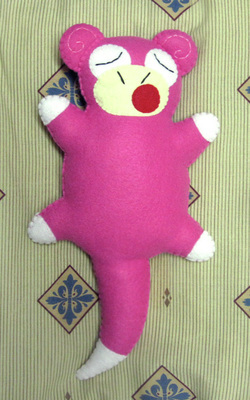 She's a seamstress as opposed to a plush maker, which might be why I noticed that some of his features are different from any other Slowpoke plush I've seen! He's about 3 inches tall, and has all the qualities of a bell plush plus more! Given to me by my dear friend Iggly (also goes by f4y3) for Christmas last year. For how tiny he is, he's got an incredible amount of detail, and is just the perfect size. 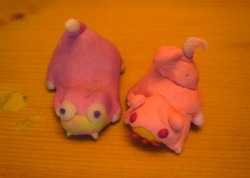 They're by far the two derpiest little Slowpoke customs that I own! These were from a trade with foureyedalien! 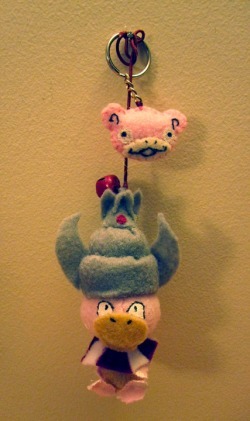 Custom Slowpoke charm by Reilaa!